Shimmer and shine. Finish your outfit in colourful style. These 9ct white gold stud earrings feature an alluring teardrop shaped aquamarine stone surrounded by a row of glistening diamonds. Elegant diamond jewellery with a statement companion. 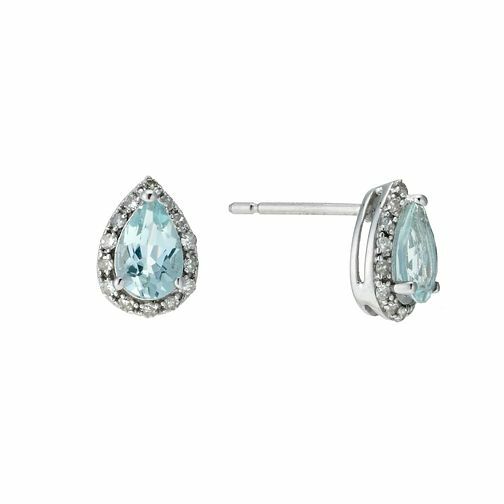 9ct white gold aquamarine & diamond earrings is rated 5.0 out of 5 by 1. Rated 5 out of 5 by Anonymous from Was a present from my partner...They are beautiful, a mixture of both our birthstones. ... Really lovely earrings but expensive...lucky got in sale and 10% off. Got earrings with and matching necklace with voucher for £50 off next purchase.. The chain is very delicate so we puchased our own chain separately but I love the pendant and earrings.